Hello my fine foodie friends! Today’s Food Star Friday post is courtesy of Kelsey Nixon from Kelsey’s Essentials. I know she isn’t a “big” food star, but I have been watching a lot of the new shows lately trying to get a feel for the up and comers. This episode of her show was all about sauces and, as you know, a sauce can make or break a recipe. So I thought I would share the link for the episode as well as one of her recipes. The episode was entitled “Sauces” and the recipe, well as you can see I made some very yummy roasted asparagus with a Beurre Blanc sauce. I am an asparagus fanatic! Hands down it is my favorite veggie with the artichoke coming in a close second. I have made asparagus just about every way possible I think, but am always open to new ways. A certain pizza I just found on Pintrest comes to mind so stay tuned for that one too! In the past I have tried many variations of this dish. Asparagus wrapped in bacon, asparagus wrapped in prosciutto, asparagus wrapped in prosciutto with a little bit of Swiss cheese tucked under the prosciutto wrap, etc. But when I saw one of my favorite side dishes made with a sauce I had never tried I knew it was meant to happen. The sauce takes a little bit of time but is oh so worth it! Actually it is not as much time as attention. If you let it get to hot you will break the sauce. But like I said this sauce is just, well perfect! We even drizzled it over our baked potatoes and steaks!! Remove the woody ends of the asparagus spears trimming the spears to the same length. Bundle 3 asparagus stalks together and wrap each grouping with one slice of prosciutto, leaving the tips exposed. Drizzle the bundles with olive oil. Roast the bundles for 10 minutes, or until the asparagus ends and the prosciutto slices are crisp. 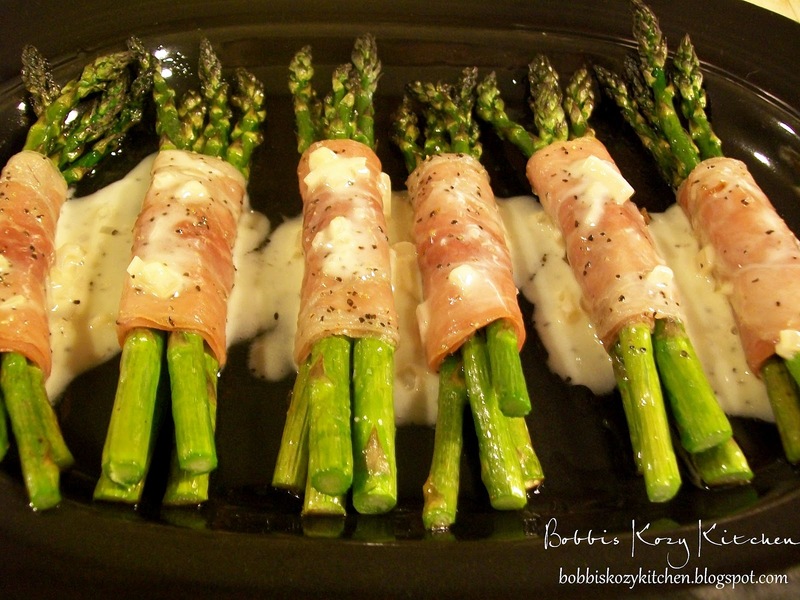 Drizzle each prosciutto-wrapped asparagus bundle with the prepared beurre blanc and serve. Bring the shallots, vinegar, and wine to a boil in a heavy-bottomed saucepan until the liquid is reduced to 2 tablespoons, about 5 minutes. Add the cream, salt, and pepper and bring to a boil for 1 minute. Reduce the heat to low and whisk in a few tablespoons butter. Continue to whisk and add a few pieces at a time of the remaining butter. Wait until each addition is incorporated before adding more butter. The sauce should remain warm, but never hot or the sauce will break. Remove the sauce from the heat and season with salt, and pepper, to taste. If desired, strain the sauce through a sieve to remove the shallot. Discard the shallot. Serve the sauce immediately.